You would never know that Satsuma (RIP) was once on the site of Jackson + Rye. The sterile white and utilitarian wood (or latterly gaudy orange pods) has been swapped for darker woods, leather banquettes and muted mood lighting. The whole layout has been swapped around as well. Whereas Satsuma had the enormous elbow to elbow shared tables in the basement, JR's downstairs is now just a small - always empty - dining room next to the bogs and a large kitchen. Most of the action happens upstairs with the beautiful bar the focus of the venue. I say RIP to Satsuma, because it was one of the places I frequented when I first lived in London back in the late 90s. I also saw one of my favourite actors eating there - Rupert Graves (who played Freddy in A Room With a View dontchaknow) around the time he was on the stage in Hurly Burly. Anyway, I digress. You want to know about JR (good for brunch, less so for dinner, no need to read more I guess mainly because my pics are a bit rubbish this time sorry) and not my filmic proclivities. I've been to JR twice now - once for brunch before Christmas and again for dinner this week. Based on what I've eaten I'd probably stick to brunch. I'm quite fussy with scrambled eggs and can think of nothing worse than dry, overcooked, lumpy ones. I requested runny eggs at JR and got exactly that with the oddly named Prison Eggs (which don't seem to be on the website menu anymore, although saying that, the all day menu lists the buttermilk chicken served with both a spicy coleslaw AND fries but actually you have to order the fries separately). 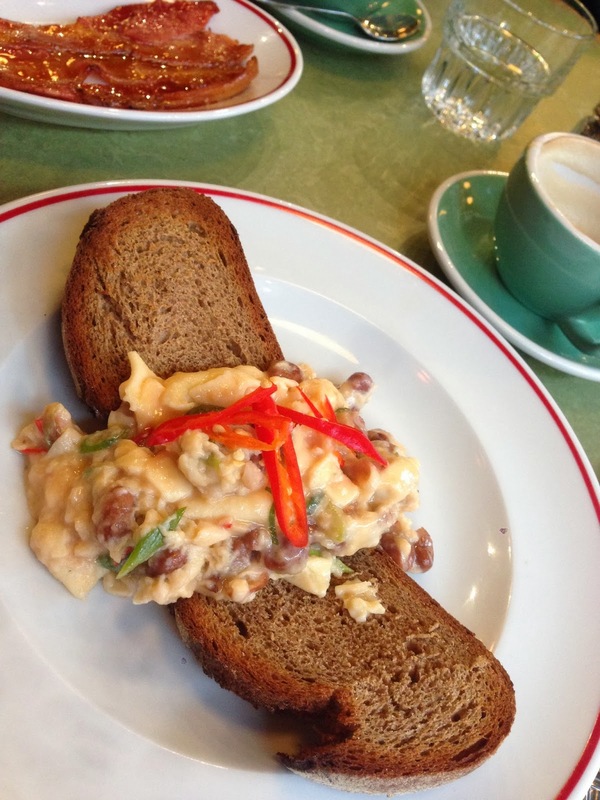 My eggs were mixed with jalapeños, borlotti beans and spring onions giving it great texture and more than a bit of pep. At £6.95, it's a cheap start to the day but it's obvious from the somewhat muted colour of the eggs that we're not in gorgeous Machiavelli egg territory here (check out Raoul's or the Golborne Deli for the sunniest eggs in London). The maple glazed bacon, ordered as a side, was insanely good but served as rashers rather than a slab as per the menu. 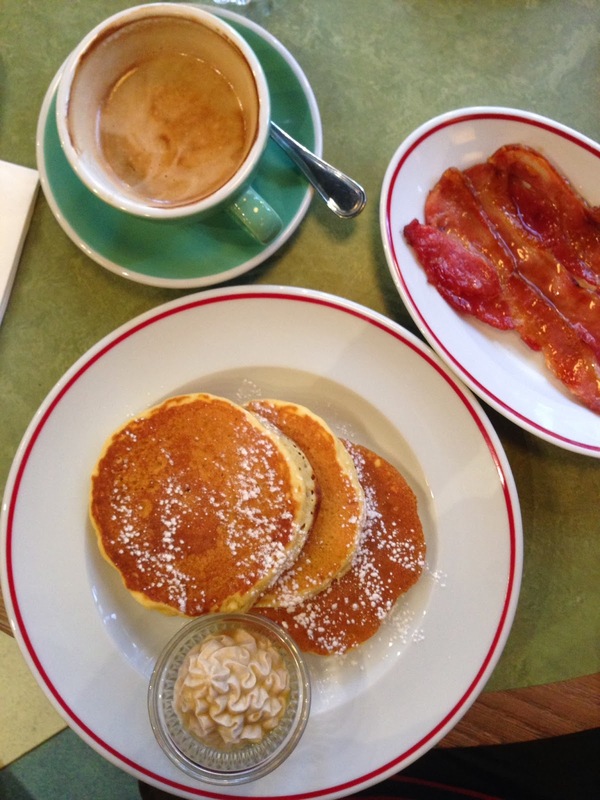 Buttermilk pancakes were light and fluffy and altogether delightful. Coffee wasn't anything to write home about, with my flat white a bitter mouthful. Nip around the corner to Flat White or FoxCroft & Ginger for a better cup. At dinner, crab cakes and fried buttermilk chicken both disappointed. The former were a little like fish fingers in flavour with the crispy exterior showing a (un)healthy nod to the deep fryer. The latter were two strips of, albeit tender, breast meat served is a semi flaccid batter. I really wanted super crispy chicken on the bone rather than the flavourless oversized chicken nuggets that I got. Perhaps I just like something to gnaw on. I liked the buttermilk tang but it could have been so much better with some seasoning in the batter. It's really a dish you could make more interesting at home for less than the £11.95 asking price (plus £2.95 for those fries). 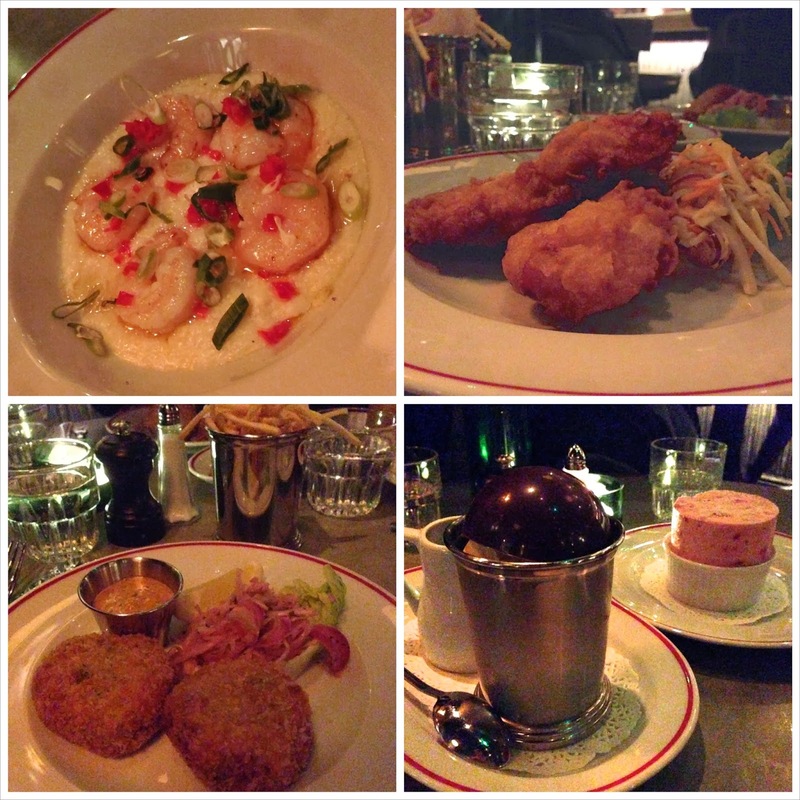 Jackson + Rye: Shrimp & Grits, Buttermilk Fried Chicken, Crab Cakes, Melting Chocolate Sundae and Frozen Soufflé. The best dish that we tried was the starter of Shrimp & Grits (£8.50). The fried prawns were sweet and plump, and I liked the spike of chilli to liven up the grits. Side dishes were underwhelming with shoestring fries lukewarm and unseasoned while the grilled little gems (£3.50) lacked the lovely smokiness that makes them memorable. Things picked up with desserts and I preferred the frozen soufflé (£6.25) which was basically a frozen raspberry parfait making it a bit lighter than the more indulgent hot butterscotch sauce covered chocolate sundae (£6.50). Dinner for three came in at about £80 (one house lemonade and a great rum float), whereas it was about £25 for brunch for two. Service on both trips was very chipper, but somewhat forgetful with drinks requested on both occasions going AWOL before being tracked down. Given the accessible pricing, this probably isn't food that's meant to wow, but the place feels within touching distance of being good. I wonder, though, if it will always fall short or elements will be tweaked as JR matures. This wasn't the slice of Americana that I was hoping for but that doesn't mean I won't return. I was able to get a table without a reservation on both visits and the location is great, with the view out onto the passing parade of Wardour St which was one of Satsuma's selling points too. You're just more likely to find me there in the morning.